13.27. Inspection: Great toe (4): Note the presence of excess callus under the great toe. This finding is highly suggestive of hallux rigidus. 13.28. Inspection: Great toenail: Note whether the great toenail is (A) deformed (onychogryphosis), (B) ingrowing, possibly with accompanying inflammation, (C) elevated (suggesting subungual exostosis), (D) uneven in texture and growth (suggesting fungal infection or psoriasis). 13.26. Inspection: Great toe (3): Note whether (A) the great toe is thickened at the MP joint, suggesting hallux rigidus (osteoarthritis of the first metatarsophalangeal joint), or (B) held in a flexed position (hallux flexus), again generally due to osteoarthritis. 13.29. Inspection: Toes (1): Note the relative lengths of the toes. A second toe longer than the first may occasionally become clawed or throw additional stresses on its MP joint; it may be associated with Freiberg's disease. 13.30. Inspection: Toes (2): Flex the toes and note the relative lengths of the metatarsals. Abnormally short first or fifth metatarsals are a potential cause of forefoot imbalance and pain. When both are short, there is often painful callus under the second metatarsal. 13.31. Inspection: Toes (3): Curly toe: in this deformity a degree of fixed flexion develops in both IP joints and the MPjoint. It is generally caused by interosseous muscle weakness. 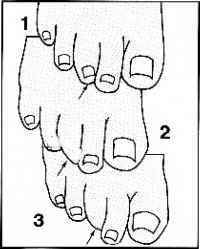 In grade 1 the toe is mildly flexed, with or without some adduction; in grade 2 there is a degree of under- or over-riding; and in grade 3 the nail is not visible from the dorsum. The toes are said to be clawed when they are extended at the metatarsophalangeal joints and flexed at the interphalangeal joints. If all the toes are involved, this suggests that there may be an associated pes cavus or some other cause of intrinsic muscle insufficiency (the lumbricals and interossei flex the MP joints and extend the IP joints). 13.33. Inspection: Toes (5): Is there a hammer toe deformity, where the toe is flexed at the proximal interphalangeal joint and extended at the MP and distal IP joint? The second toe is most commonly affected, often owing to an associated hallux valgus deformity. There is usually callus over the prominent interphalangeal joint as a result of pressure against the shoe. 13.34. Inspection: Toes (6): Note the presence of (A) a mallet toe deformity (flexion deformity of the distal interphalangeal joint). There is usually callus under the tip of the toe or deformity of the nail. 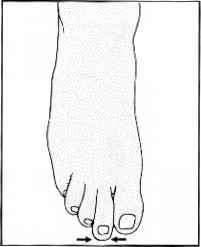 Note (B) an overlapping fifth toe or quinti varus deformity (often congenital). 13.35. Inspection: Toes (7): Note the presence of (A) hard corns. These are areas of hyperkeratosis that occur over bony prominences, and are generally caused by pressure against the shoes. (B) Soft corns are macerated hyperkeratotic lesions occurring between the toes and are not associated with pressure or friction. 13.36. Inspection: Sole (1): Note (A) Hyperhidrosis. (B) Evidence of fungal infection or athlete's foot. (C) Ulceration of sole, suggesting pes cavus or neurological disturbance (trophic ulceration). 13.37. Inspection: Sole (2): Note the presence of callus, indicating an uneven or restricted area of weightbearing. Be careful to distinguish between abnormal, local thickening, and diffuse, moderate thickening at the heel and under the metatarsal heads (which is normal). 13.38. Inspection: Sole (3): Note the presence of a verruca (plantar wart). Note the three classic sites: at the heel, under the great toe. and in the forefoot in the region of the metatarsal heads. In the sole they are situated between the metatarsal heads: unlike calluses, they do nor occur in pressure areas. 13.39. Inspection: Sole (4): Verruca, ctd. A verruca is exquisitely sensitive to side lo side pressure. Calluses are much less sensitive, and only to direct pressure. If there is any remaining doubt a magnifying lens may be used to confirm the central papillomatous structure of the verruca. 13.40. Inspection: Sole (5): Note any localized fibrous tissue masses in the sole typical of Dupuytren's contracture of the feet. These tissue thickenings arise from the plantar fascia, and are attached to the skin. Always inspect the hands, as both upper and lower limbs are often involved together in this process. 13.41. Posture (1): Examine the patient standing. 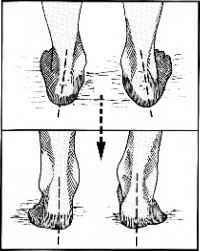 Are both the heel and forefoot squarely on the floor (plantigrade foot)? If the heel does not touch the ground, examine for shortening of the leg or shortening of the tendocalcaneus. 13.42. Posture (2): Intoeing: If this deformity is present, examine for (A) torsional deformity of the tibia, (B) increased internal rotation of the hips, or (C) adduction of the forefoot. Most cases of intoeing in children resolve spontaneously by age 6. 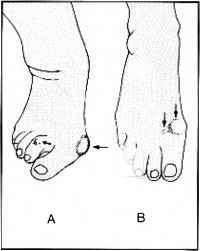 13.44 Posture (4): Eversion: If the foot is everted this suggests (A) peroneal spastic flat foot, (B) a painful lesion on the lateral side of the foot, (C) if less marked, pes planus. 13.45. 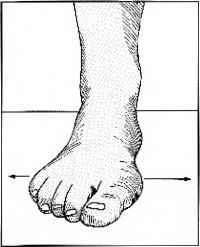 Posture (5): Inversion: If the foot is inverted this suggests (A) muscle imbalance from stroke or other neurological disorder, (B) hallux flexus or rigidus, (C) pes cavus, (D) residual talipes deformity, (E) a painful condition of the forefoot. 13.43. 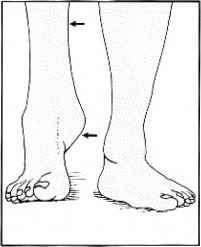 Posture (3): Genu valgum: Note the presence of genu valgum, which is frequently associated with valgus flat foot. Genu valgum in turn is most commonly seen as a result of a growth disturbance about the knee, or as a complication of rheumatoid arthritis. 13.46. Posture (6): Splaying: Note whether there is any broadening of the forefoot. 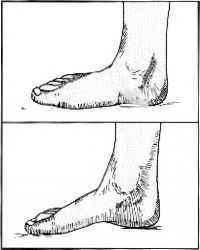 This is often the result of intrinsic muscle weakness, and may be associated with pes cavus, callus under the metatarsal heads, hallux valgus, anterior metatarsalgia, and trouble with shoe fitting. 13.47. Posture (7): The toes: Reassess the toes for curling, clawing, mallet toe and hammer toe. 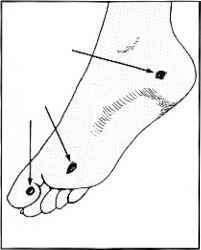 Reassess the great toe, particularly for the degree of hallux valgus, overriding of adjacent toe(s). and torsion. With the patient weightbearing, look at the medial longitudinal arch and try to assess its height. Try to slip the fingers under the navicular. 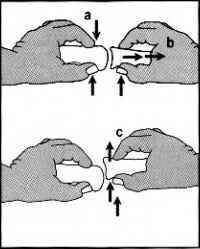 In pes cavus, the fingers may penetrate a distance of 2 cm or more from a vertical line dropped from the medial edge of the foot. 13.49. Posture (9): Medial arch (2): If the arch appears high and accentuated, this suggests a degree of pes cavus. Look for confirmatory clawing of the toes, callus or ulceration under the metatarsal heads, and alteration of the footprint. 13.50. Posture (10): Medial arch (3): If pes cavus is present, carry out a full neurological examination. Look at the lumbar spine for dimpling of the skin, a hairy patch, or pigmentation suggesting spina bifida or neurofibromatosis. Radiological examination of the lumbar spine is desirable. 13.51. Posture (11): Medial arch (4): In pes planus, the medial arch is obliterated. The navicular is often prominent, and the fingers cannot be inserted under it. 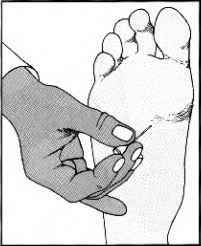 Ask the patient to attempt to arch the foot. In mobile flat foot the arch can often he restored voluntarily. Note that in children the arches are slow to become established. Examine the Achilles tendon, shortening of which can cause flat foot. 13.52. 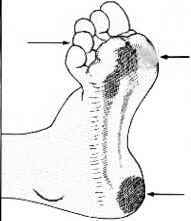 Posture (12): Medial arch (5): If pes planus is suspected, re-examine the sole for confirmatory evidence of callus under the metatarsal heads, and an increase in the area of the sole involved in weightbearing (i.e. extension of the narrow lateral strip). The footprint will be abnormal in these circumstances. Note also the presence of any knock-knee deformity. 13.53. Posture (13): Medial arch (6): In pes planus, assess the mobility of the foot first by asking the patient to stand on the toes, while at the same time examining the alteration in the shape of the foot by sight and feel. Later in the examination carefully note the range of inversion and eversion. 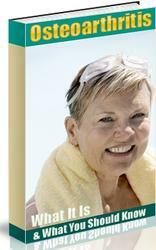 Note that although 23% of adults have flat feet, symptoms are not usually present unless there is associated stiffness. 13.54. Posture (14): Heels (1): Look at the foot from behind, paying particular attention to the slope of the heels. 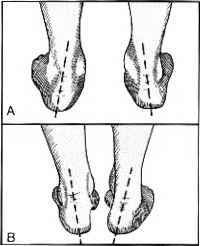 Note (A) valgus heels are associated with pes planus, (B) varus heels are associated with pes cavus. 13.55. 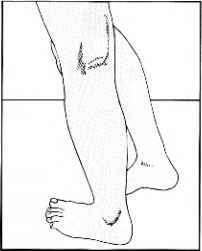 Posture (15): Heel (2): Again ask the patient to stand on the toes, observing the heels. If the heel posture corrects, this indicates a mobile subtalar joint. Persisting deformity suggesting loss of movement, which may be due to arthritic changes, tarsal coalition, loss of spring ligament or tibialis posterior function, or shortening of the tendocalcaneus. 13.56. Gait: Watch the patient walking, first barefooted and then in shoes, to assess the gait. Examine from behind, from in front, and from the sides. A child should also be made to run. A reluctant child can usually be coaxed to walk holding its mother's hand. Highly technical methods of gait analysis using force plates, computer and videoanalysis etc. are available in some centres. 13.57. Skin temperature: Grasp the foot and assess the skin temperature, comparing one side with the other. Take into account the effects of local bandaging and the ambient temperature. A warm foot is particularly suggestive of rheumatoid arthritis or gout. 13.58. Circulation (1): If the foot is cold, note the skin temperature gradient along the length of the limb. You should have already observed any trophic changes or discoloration of the skin suggestive of ischaemia. 13.59. Circulation (2): Attempt to palpate the dorsalis pedis artery. The vessel lies just lateral to the tendon of extensor hallucis longus and its pulsation should be felt by compressing it against the middle cuneiform. A good pulse generally excludes any significant degree of ischaemia. 13.60. 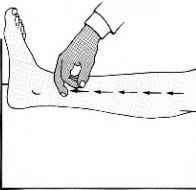 Circulation (3): Now try to feel the anterior tibial pulse near that midline of the ankle, just above the joint line where the vessel crosses the distal end of the tibia. 13.61. Circulation (4): The posterior tibial artery is often difficult to find, and it is helpful to invert the foot while palpating behind the medial malleolus. 13.62. Circulation (5): Next seek the popliteal artery. When the patient is supine it can only be felt by applying strong pressure in an anterior direction, with the knee flexed to force the vessel against the femoral condyles. Alternatively, it may be sought with the patient prone. 13.63. Circulation (6): The femoral pulse may be felt a little to the medial side of the midpoint of the groin, when the artery can be compressed against the superior pubic ramus. 13.64. Circulation (7): Examine the abdomen, palpating the abdominal aorta. Note the presence of pulsation as it is compressed against the lumbar spine, and note any evidence of aneurysmal dilatation. 13.65. Circulation (8): Note any cyanosis of the foot when dependent and any blanching on elevation, suggestive of marked arterial insufficiency. 13.66. 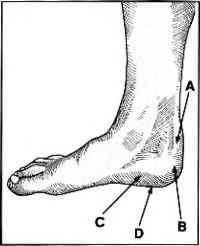 Tenderness (1): Heel: Tenderness round the heel is present in (A) Sever's disease; (B) superior calcaneal exostosis and tendo calcaneus bursitis: (C) plantar fasciitis and inferior calcaneal exostosis; (D) pes cavus. Diffuse tenderness under all the metatarsal heads is common in anterior metatarsalgia, pes cavus and pes planus, gout and rheumatoid arthritis. Tenderness under the second metatarsal head and over the second metatarsophalangeal joint is found when the second toe subluxes as a sequel to hallux valgus or rheumatoid arthritis. Puffy, localized swelling on the dorsum of the foot, palpable thickening of the second metatarsophalangeal joint, pain on plantarflexion of the toe, and joint tenderness are diagnostic of Freiberg's disease. Tenderness on both plantar and dorsal surfaces of the second or third metatarsal necks or shafts occurs in march fracture. 13.71. Tenderness (6): Forefoot (5): Suspected plantar neuroma (Morton's metatarsalgia) (1): Sharply defined tenderness between the metatarsal heads (most commonly between the third and fourth) is found in plantar digital neuroma. Compress the metatarsal heads (a) and note whether this reproduces the patient's symptoms of pain and possibly paraesthesia (Mulder's sign). Repeat while simultaneously pressing in a coordinated fashion from the sole towards the dorsal surface and back with the other hand (b). This may result in a painful click, which some consider to be associated with a mobile neuroma. Sometimes the patient complains of paraesthesia in the toes, and sensory impairment should be sought on both sides of the web space involved. The symptoms and findings from MP joint instability in a toe may be confused with Morton's metatarsalgia, so always perform the drawer test. 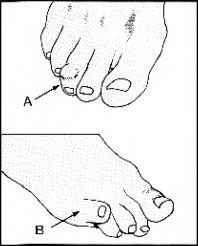 To do so, grip the metatarsal at the suspect level with one hand (a) and with the other, while applying traction to the toe (b), attempt to displace it dorsally (c). Pain and excessive translation are diagnostic of instability. 13.75. Tenderness (7): Tarsal tunnel syndrome (1): Tenderness may occur over the posterior tibial nerve in the tarsal tunnel syndrome, where the presenting symptoms are usually of local pain and paraesthesia in the foot. 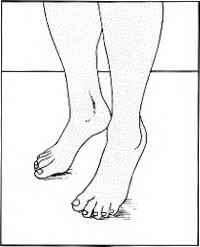 Note that tenderness at the same site may occur in problems affecting the tibialis posterior tendon (which may be visualized by inverting the foot against resistance). 13.76. 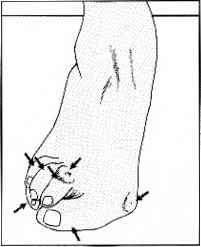 Tarsal tunnel syndrome (2): Tinel's sign: In the tarsal tunnel syndrome, tapping over the posterior tibial nerve may give rise to paraesthesia in the sole of the foot. 13.77. Tarsal tunnel syndrome (3): Test sensation over the whole of the sole of the foot and the toes in the area of supply of the medial and lateral plantar nerves (the two terminal divisions of the posterior tibial nerve). Compare the feet. Sensory loss is in fact rather uncommon in tarsal tunnel syndrome. 13.78. 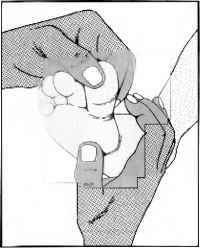 Tarsal tunnel syndrome (4): The dorsiflexion-eversion test (Kinoshita et al. 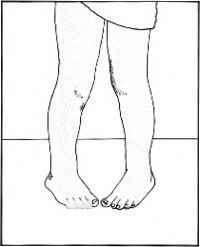 ): Maximally dorsiflex the ankle (a) and the MP joints of all the toes (b); firmly evert the foot (c) and hold this position. In a positive case the patient's symptoms will be reproduced, sometimes after only a few seconds. Look also for increased local tenderness (d) accompanying the manoeuvre. In gout, tenderness is often most acute but is diffusely spread round the whole metatarsophalangeal joint and often the entire toe. There is often a reddish-blue discoloration of the skin round the toe. 13.79. 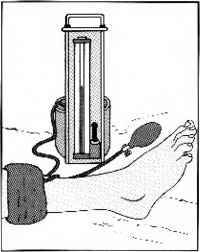 Tarsal tunnel syndrome (4): The tourniquet test: In doubtful cases, apply a tourniquet to the calf and inflate to just above the systolic blood pressure. If this brings on the patient's symptoms in 1-2 minutes, the diagnosis is confirmed. Pain and pallesthesia on the dorsum of the foot may be encountered in the much rarer superficial peroneal nerve compression syndrome. 13.82. Tenderness (10): In sesamoiditis there is tenderness over the sesamoid bones, which are situated under the first metatarsal head, although they may sublux laterally to a marked degree, especially in cases of gross hallux valgus. Pain is produced if the toe is dorsiflexed while pressure is maintained on the sesamoid bones. In subungual exostosis pain is produced by squeezing the toe in the vertical plane. 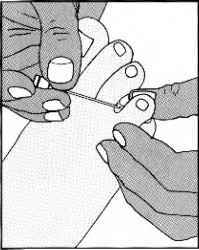 In ingrowing toenail pain is produced by side-to-side pressure. 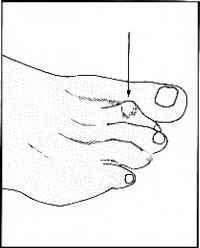 (A) In hallux valgus tenderness is often absent, or confined to the bunion or over painful corns on adjacent toes. (B) In hallux rigidus there is usually tenderness over the exostoses that arise on the metatarsal head and proximal phalanx, often on the dorsal surface of the joint as well as the lateral side, where protective bursae may form. 13.84. 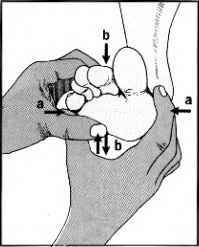 Crepitus: Move the great toe in an up and down direction while palpating the metatarsophalangeal joint. Repeat with the interphalangeal joint. Crepitus, indicating osteoarthritic change, is constant in the metatarsophalangeal joint in hallux rigidus. Interphalangeal joint crepitus is considered a contraindication for MP joint fusion.